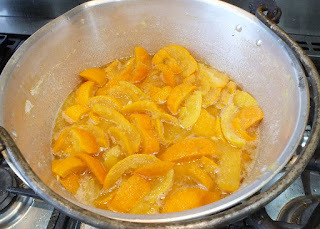 It's the time of year that the Seville Oranges are in the shops, so it's a great time to make home made marmalade. The only problem is slicing up all those oranges is slow and tedious, so I want to share with you my recipe for a cheat method. You get a more chunky marmalade, not so clear, but it still tastes the same. It wont win any awards, but it takes a lot less effort and tastes just as good. Put the oranges and lemons in a large saucepan, ideally a preserving pan, cover with water. Bring to the boil and then boil gently for 2 hours. Allow to cool, leaving overnight is fine. Take the fruit out of the pan and throw away the water. Put a fine kitchen seive over the preserving pan. Cut the oranges and lemons in half and then gently scoop out the centre into the seive. You want to get out all the pips, but you don't want to scrape out more than is necessary. Put the pips and gunge into the seive, slice the rind into rough pieces, about 8th's is fine and then put in the pan. Squeeze the pip gunge through the sieve until as much of it as possible is in the pan, I find running a soup ladle round is the easiest way (keep the ladle out, you'll need it later). Throw what's left of the pips away. Add the sugar to the pan and put over a low/medium heat until the sugar has all melted. Now using the hand blender chop up the peel, just give very short bursts, as a large piece surfaces hit it with a quick burst of the blender. 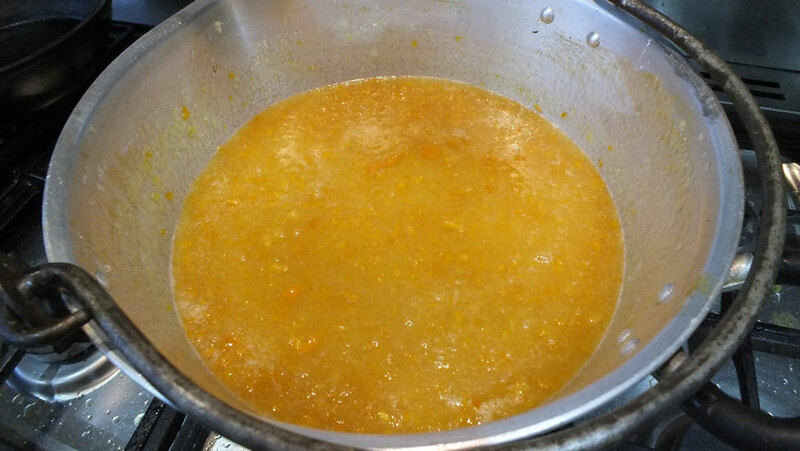 Do this until there are no more large pieces left, but be careful, you don't want to end up with orange soup, you want a good even mix of small pieces. 8. Use the blender to chop the peel into small pieces, the size is really your choice. Now bring up to the boil and boil for 10 minutes. Put your clean jars into the over on 100c. Test for setting point: To do this get the plate out of the freezer, drop a blob onto the plate and leave for a minute. Then push it with your finger, if it wrinkles up it's ready, if not put the plate back in the freezer, boil the marmalade for another 5 minutes and try again. Repeat as nceessary. 11. Pour into hot jars and seal. Pour into hot jars, put on lids and once cool label and store. 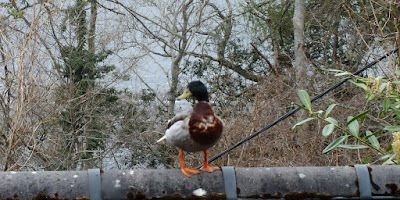 Of course there's an easier way to obtain home made marmalade, we have a few extra jars so you can buy one to take home when you stay at Pottery House Loch Ness B&B.